NASHVILLE, Tennessee — Nashville’s Country Radio Seminar (CRS) is an annual showcase week for the industry where new artists and music that will be released over the course of the year is presented to top country radio people and industry heavyweights. 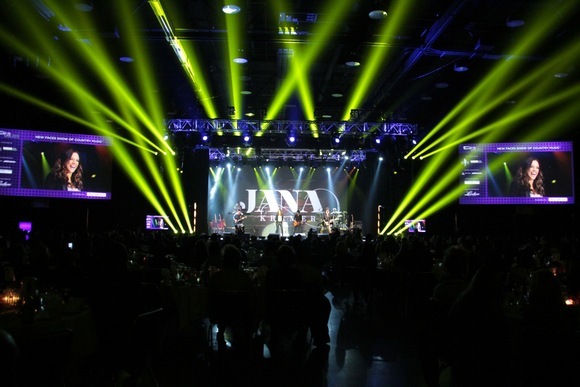 This year’s CRS took place at the Nashville Convention Center, February 27 through March 1 and wowed the more than 5,000 attendees with live performances by Brad Paisley, Vince Gill, Darius Rucker, Gary Allan, Kellie Pickler and many more--all heard through HARMAN’s JBL VTX Series line arrays powered by Crown I-Tech HD amplifiers. Live sound for the event was provided by Franklin, Tennessee-based CTS Audio, working with event production company DeLux Productions. CTS staff for the event included CTS vice president Mike Taylor, front of house engineer Jon Schwarz, monitor engineer Scott Heyniger and system techs Jeremy Bayne and Joey Eaker. “We’ve supplied the sound for CRS for nine years and this is the first time we used JBL’s VTX line arrays for the event, so we were stoked to hear what they could do in this room,” Taylor said. CTS flew nine VTX V25 fullsize line array elements and eight VTX S28 subwoofers on each side of the 30x40-foot stage, complemented by four JBL VERTEC® VT4888 midsize line array elements used as delay speakers. The V25 speakers and S28 subwoofers were driven by 32 Crown I-Tech 12000HD amplifiers, with 16 Crown VRACK 12000HD and four VRACK 4X3500HD complete amplifier management rack systems powering the VT4888 delay speakers. Because there wasn’t much room for the delay amp racks, the VRACK’s self-contained design, which houses three I-Tech 12000HD amps, an input panel and power management, proved ideal for the application thanks to its high 27000 watts of total power (into 4 ohms) contained in a smaller-footprint package. CTS used JBL HiQnet Performance Manager™ software and BSS Soundweb London BLU-80 signal processors for system control and tuning. CTS Audio has been a JBL VERTEC user for many years and Taylor was impressed by the VTX line arrays. “We got a tremendous amount of headroom using the VTX, and as much as we continue to rely on VERTEC, the improvement in clarity, coverage and power output from these boxes was noticeable,” Taylor said. He also found the Crown amps to be an ideal match with the VTX speakers, thanks to their built-in DSP and HiQnet compatibility that enabled the amps to be easily and precisely tuned to get the most out of the VTX arrays during the event.